Nissan selected AeroVironment as their supplier for home charging stations and installation services for the Nissan Leaf. Why? The Nissan Leaf will likely be the first high production electric vehicle offered this century. Going with AeroVironment, it means that Nissan chose to go with a large established company vs. a smaller company that just makes EV chargers (like ClipperCreek). This is similar to other decisions by large auto manufacturers that chose to go with big companies (Volt=LG, Leaf=NEC) for their battery technology vs. smaller ones like A123. No pricing has been set, but the charger will be 220v with a J1772 connector. It's also unclear whether AeroVironment will be doing all the installations themselves, or if they will be using local electrical contractors. I'm thinking that they'll use local labor to do the wiring. Given that there is no display on the charger...and the Leaf will have a satellite communications system like OnStar, the AeroVironment charger is probably "smart charger" like the Tesla's...with no direct network connection. The Leaf communicates with it's mothership (Nissan) for a variety of info...charge level, accident awareness, charging stations, etc.. You can read all about the Nissan Leaf's communication methods at Technology Review. DETROIT (Jan. 11, 2010) – Nissan North America (NNA) today announced its selection of AeroVironment (NASDAQ: AVAV) (AV) to supply electric vehicle home-charging stations and installation services supporting the introduction of the zero-emission, all-electric Nissan LEAF later this year. The Nissan LEAF five-passenger electric car will be powered by an advanced, lithium-ion battery pack that will provide a drive range of 100 miles on a full charge, as measured by the LA4 test cycle. AV’s Nissan-branded charging stations will be available at the sale of each Nissan LEAF as part of the vehicle’s total driving system. The home-charging stations are designed to provide a safe and reliable charge when installed with a connection to a 220-volt line. It will take eight hours to fully charge the Nissan LEAF from a fully discharged state. 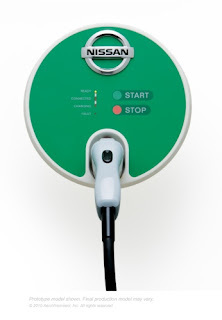 Home charging will represent a highly convenient charging method for the Nissan LEAF customer. AV’s nationwide network of qualified, licensed electricians will offer pre-installation home assessment services prior to vehicle delivery, and will install the charging stations. Nissan announced this supply agreement at the North American International Auto Show, where the Nissan LEAF was being displayed for international media Jan. 11-12. Nissan, along with its alliance partner Renault, is the only automaker committed to making all-electric vehicles available to the mass market on a global scale. The Nissan LEAF will go on sale in select markets in the United States in December. In North America, Nissan's operations include automotive design, engineering, consumer and corporate financing, sales and marketing, distribution and manufacturing. Nissan is dedicated to improving the environment under the Nissan Green Program 2010, whose key priorities are reducing CO2 emissions, cutting other emissions and increasing recycling. More information on the Nissan LEAF and zero emissions can be found at www.nissanusa.com/leaf-electric-car. Building on a history of technological innovation, AV designs, develops, produces, and supports an advanced portfolio of Unmanned Aircraft Systems (UAS) and efficient electric energy systems. Agencies of the U.S. Department of Defense and allied military services use the company’s battery-powered, hand-launched UAS to provide situational awareness to tactical operating units through real-time, airborne reconnaissance, surveillance, and target acquisition. AV’s clean transportation solutions include power cycling and test systems and industrial electric vehicle charging systems for commercial and institutional customers, as well as EV home chargers and EV fast chargers for consumers. More information about AV is available at www.avinc.com. Building on a history of technological innovation, AV designs, develops, produces, and supports an advanced portfolio of Unmanned Aircraft Systems (UAS) and efficient electric energy systems. Agencies of the U.S. Department of Defense and allied military services use the company's hand-launched UAS to provide situational awareness to tactical operating units through real-time, airborne reconnaissance, surveillance, and target acquisition. Commercial and government entities use AV's clean transportation solutions such as electric vehicle test systems and electric vehicle fast charge systems, as well as its clean energy solutions. More information about AV is available at www.avinc.com. Building on a history of technological innovation, AV designs, develops, produces and supports an advanced portfolio of Unmanned Aircraft Systems (UAS) and efficient electric energy systems. Agencies of the U.S. It's a good move for the Nissan company to choose this AeroVironment technology in charging its electric cars. This will not only prove the companies innovations towards better EV cars, but also gives a better result to the environment. Nissan Leaf would be a great back up for my car that I bought from one of the Audi dealers in NY. I was actually looking for a Toyota Certified Pre Owned car, but I think that getting an electric car is also a good choice. It's not only innovative but also environmentally friendly. Not bad for a car. But I don't know if my electric bills would be higher than before or less payment for not having gas for it. I would have to look at used cars long island first . If I am going to loan for a car, I think I will have to go for an electric vehicle like this Nissan Leaf. This is because of the advantages or benefits of using EVs over vehicles that run on conventional fuels such as gasoline, propane and diesel. It's a good move for the Nissan company to choose this AeroVironment technology in charging its electric cars. Home charging stations are more convenient rather than staying in electric car stations. This is a really great invention!